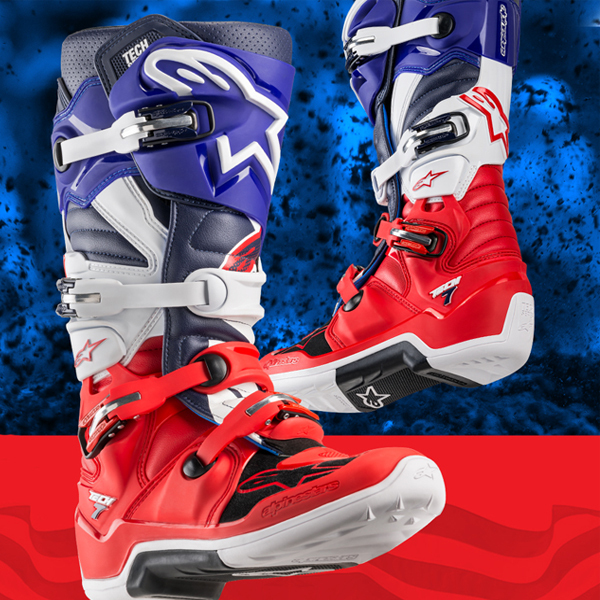 The revolutionised Tech 7 MX boot incorporates innovative materials and technology in a completely new design for a lighter, more anatomically profiled performer. This CE certified boot promotes core stability and flex via a biomechanical pivot while offering excellent ankle protection. The boot chassis has been designed to give complete feel and optimised interaction with bike controls, while the innovative buckle system allows easy, precise closure. Boot chassis designed with an ergonomically profiled forefoot and lower toe-box to provide easier shifting and improved rear brake feel and control. Incorporating an innovative one-piece injected dual compound foot shell with co-injected hard toe protector and integrated steel shank. The shell is highly resistant to abrasion and impact, adds to the boot’s overall durability and improves boot’s streamlining. New dual compound sole is seamlessly integrated into the base structure for superior durability, high performing rubber grip patterning, and feel. The sole and footpeg insert are replaceable. Upper constructed from innovative microfiber material that is flexible and abrasion resistant. Upper material is reinforced with PU for high levels of water-resistance and durability and improved weight-saving performance. Material ensures consistent fit even for long term usage and is easy to maintain and clean. 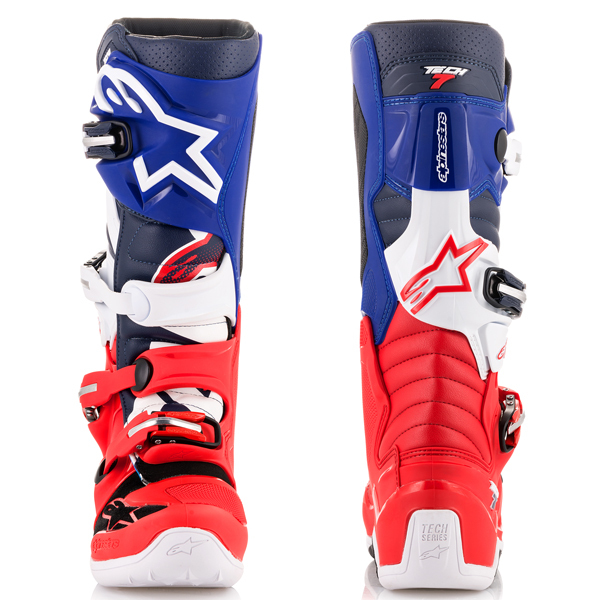 Contoured calf protector plate is injected with high modulus polymer for impact resistance and incorporates Alpinestars’ developed blade flex system for greater precision control and movement, added protection for heel and Achilles tendon and helps prevent hyperflexion. 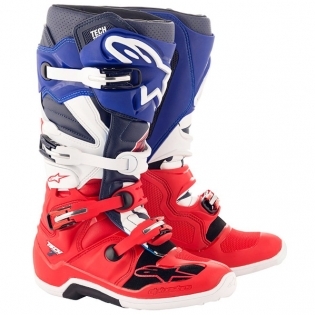 New TPU ankle protection system incorporating a biomechanical link between the middle and bottom sections of the boot helping prevent damage to the leg by providing progressive force relief for torsional forces. 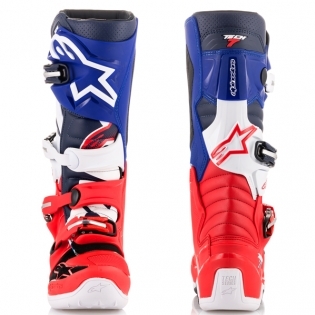 Alpinestars developed TPU shin plate and medial protection are constructed from one single part for greater structural integrity and stability. The anatomically profiled shin plate features a dual closure system with an internal microfiber flap attached with Velcro® for a precise fit closure while the rugged and durable shin plate attached securely with a precision adjustable buckle. The TPU medial side panel incorporates an advanced honeycomb rubber insert and is designed for excellent grip against the bike while guarding against impact. Wide entry aperture for convenience and allows broad ranging calf fit adjustment and support. 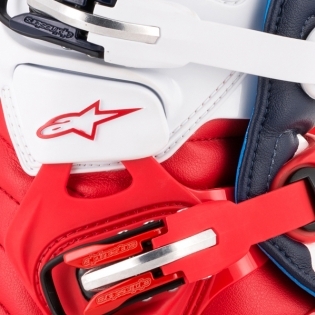 Innovative buckle closure system includes high-impact aluminium bridge closures, with memory settings and a quick release/locking system with self-aligning design for easy, precise closure and improved riding performance. All buckles are replaceable. Redesigned instep and Achilles accordion flex zones construction for superior comfort, control and support. Extended microfiber gaiter helps prevent excessive water and dirt entry. Internal lining includes anti-slide microfiber suede on the heel to help keep foot in position. Soft foam reinforcement on ankles and collar for long lasting comfort and shock absorption. New, dual compound, removable anatomic footbed includes EVA and Lycra top for comfort and support ensures even weight distribution and reinforced heel. 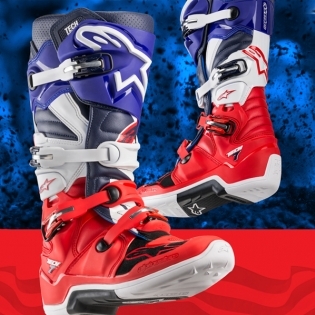 The Tech 7 boot is CE certified and features a unique, high strength sole construction offering durability and protective performance.